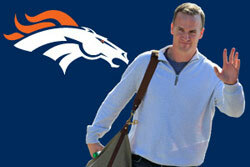 The Broncos have tentatively scheduled a Tuesday news conference at 3 p.m. ET in the team meeting room of the Broncosâ€™ training facility, according to a team release. After a jubilant Monday at the clubâ€™s Englewood, Colo., facility, Denver salary cap director Mike Sullivan spent much of the evening working on details of the deal with Manningâ€™s agent, Tom Condon, long after others had left, NFL Network's Albert Breer reported. Like the other clubs vying for Manningâ€™s services, the Broncos have known that theyâ€™d be working off the parameters of the five-year, $90 million deal Manning signed with the Colts in August. But the structure is expected to vary, and protections will be written for the club in case Manningâ€™s neck problems recur. The league also must approve the deal.